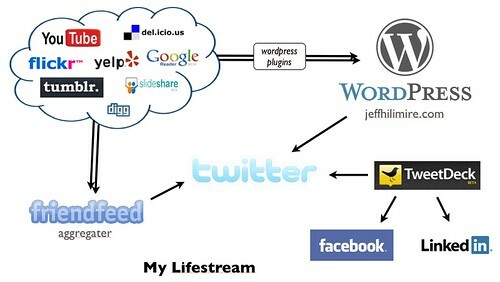 Do you have a lifestream? My guess is yes even if you don’t know it. Ah, what’s a lifestream exactly? According to Wikipedia: The term lifestream was coined to describe…a time-ordered stream of documents that functions as a diary of your electronic life; every document you create and every document other people send you is stored in your lifestream. Lifestreams are also referred to as social activity streams or social streams. It’s certainly the last bit, social activity streams or social streams, that I’m referring to when I use the term. Here is a diagram of my lifestream at the moment. What I’ve set up is a way for me to use the web/mobile in my natural flow and at the same time let my friends know what I find interesting. So if I’m at a restaurant and decide to write a quick Yelp review, as soon as I submit that review it will show up on my twitter feed and on my blog. I’m always in Google Reader checking out the RSS feeds I have set up and when I find an interesting article I can click “Share” and immediately it goes through the same process (posts the article on twitter and my blog). I don’t have to go and update those channels, I’ve set up this system to do that for me. Below is another use case. In this example, I favorited the Pants on the Ground video (I only favorited that for this example, I promise :). As soon as I did that, it ended up on FriendFeed, which then pushed it out to Twitter. 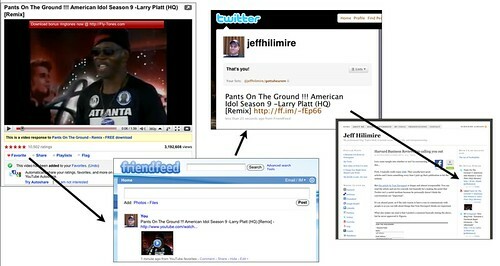 My blog then picked it up in the “My Social Stream” column on the right. Click on the image to see it larger. I’d love to hear if you have a similar process and/or if you have any recommendations. I know I could simplify some of this by removing FriendFeed as many of these services now allow you to set up automatic triggers, however I like the idea of going to one place to control my distribution and for now, FriendFeed does that well.